A brainy skeptic’s attempt to think his way into the church failed time and time again. Although his mind was armored, his heart was not. An argument, a heartbreak, and a cathedral all came together at the right time. Though he was crushed, he was not destroyed, and he became The Liturgy Kid. Strange forces surrounded Andrew Amanda from their earliest spark of existence. This young hero has undergone a gut-wrenching transformation in the depths of hatred and despair. Brainwashed as a child, exiled as a teen, they have recently broken forth into new life. Meet the eager faith of childhood, watch as it is cruelly twisted into a mockery of religion before being dissolved in the acid of ignorance. Watch as the brave hero-to-be battles the forces of hatred and fanaticism within two communities. Will they make it to the shelter of the fortress guarded by the bright red doors? Can they survive the pressures of this world pushing them to conform? Welcome to the first installment of the BLAZING BUTTERFLY SAGA! Sitting in Quaker Meeting of a warm Sunday morning, she reflected that there wasn’t much in her life. Then, like she had heard it would happen (but not quite believed), she was on her feet preaching. The Spirit had moved through her and she knew almost at the same time that she would return to the church of her childhood, The Episcopal Church. What she didn’t know was how it would end. She still doesn’t. I began my days as a street cat, but fell into dissolution and begging for wet food once I moved inside. I sought refuge in the church, and came home confused but grateful, committed to sharing my faith with the stray cats outside the screen door. The Blessing of Armistead from Brendan O’Sullivan-Hale on Vimeo. He grew up the quintessential first child, a ruler follower extraordinaire, but through the simple invitation from a Realtor® to his parents, Steve Pankey found his way into a church that is living, active, and welcomes his passion for church-nerdery, invites his questions, and has room for lots of differing opinions. 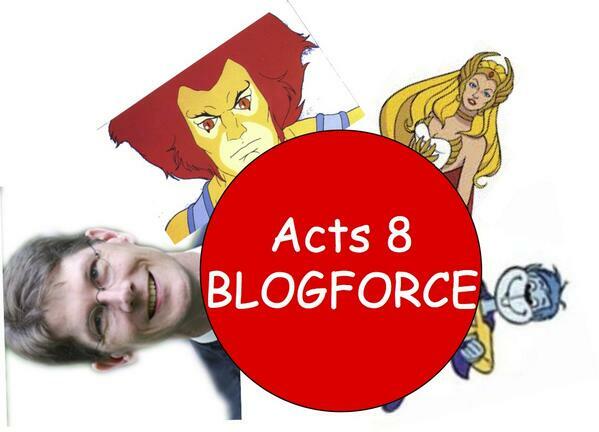 Acts8 will be hosting a one-hour tweetchat on the evening of this roundup (11/24) at 9PM EDT/6PM PDT. Use the hashtag #acts8tc.